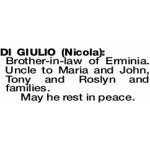 The Funeral Mass for Mr Nicola (Nick) Di Giulio of Yokine will be celebrated in St Lawrence Roman Catholic Church, 392 Albert Street, Balcatta commencing at 10.30am on THURSDAY (11.4.2019). The Cortege will leave the Church at the conclusion of the Mass and arrive at the main entrance of KARRAKATTA Cemetery, Railway Rd, Karrakatta at 12 noon for Entombment Service at the Mausoleum. Vigil Prayers and Rosary will be recited in Bowra & O'Dea Chapel, 502 Wanneroo Rd, cnr Victoria Rd, Westminster at 7pm on WEDNESDAY (10.4.19). Brother-in-law of Erminia. Uncle to Maria and John, Tony and Roslyn and families. 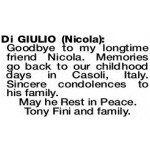 Goodbye to my longtime friend Nicola. Memories go back to our childhood days in Casoli, Italy. Sincere condolences to his family. May he Rest in Peace. Tony Fini and family.